Boost your taste buds to an endless delight with MyFlowerTree! 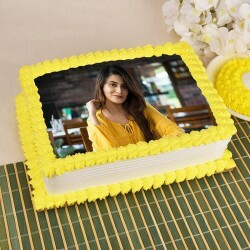 Send photo cakes to your dear ones and give a personalized touch by beautifully decorating it with amazingly printed personalized photos given by you. It is almost impossible to imagine a celebration without a necessary cake cutting ceremony in it. Cakes are not some mere dessert that you gorge on; these rich delicacies are far more symbolicin value than what is assumed. The manner in which the sight of cakes lights up everyone's face makes them worth it! If you have eagerly waited for the cake cutting to begin on your birthday, you probably know this feeling. Cakes,in many instances, have lot of sentiments attached to them. From bearing expression of well-wishes to signifying the onset of happy times, cakes have played a huge part in our special events. 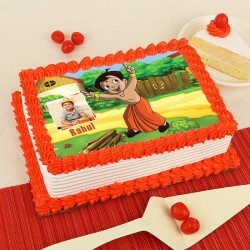 The availability of personalized cakes online has provided a good boost to this custom. 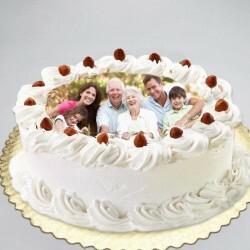 A photo cake allows you to add that hint of a personal touch to your cake to make it even more special. It enables you to relay your love, warmth, and good wishes straight to the recipient without the need to speak. It is this, besides their deliciousness and aesthetic value,which has made them a huge success with people all around. When to send a photo cake? Mother's Day ' Let's agree mothers are the most important people we have in our lives. Although it is not possible to repay all that our mothers have done for us, a little initiative in the direction of expressing gratitude to her can be by getting her a customized cake. Father's Day ' A father is the pillar in any child's life. All our lives they shower us with care and love and keep all harm at bay. 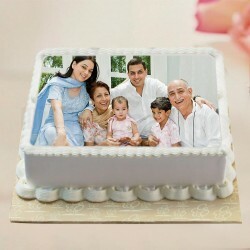 To make Father's Day more memorable, you can get a nice photo with your father printed on a cake. Let your father know the warmth, affection and respect you hold for him. Anniversary- Photos are a means of reliving a special moment and what better occasion for this than an anniversary. 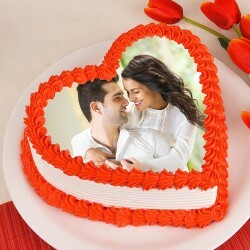 Now,to celebrate your love and togetherness in a more enticing manner, you can buy anniversary cake online and get it customized with a lovely photograph of the two of you. Cherish your special moments while enjoying a tasty treat. Birthday ' You can now convey your well-wishes to your dear ones on their birthday even while you are away. 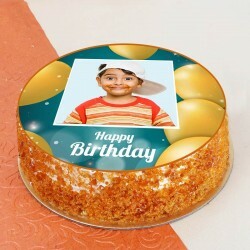 Order a photo birthday cake online for Birthday and add a personalized touch to it. Let your treasured ones know that you remember them and wish them the best of what is to come. 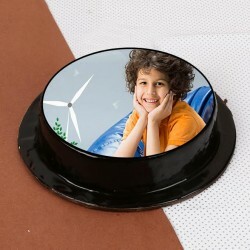 A photo cake will add more fascination to the whole event and make your attempt a success. Valentine's Day- Now you do not require to be poetic or artistic, to do something extraordinary for your darling. 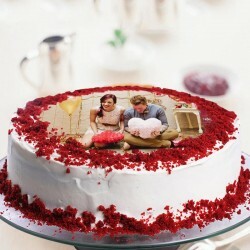 A photo cake can be your memorabilia on the coming Valentine's Day to your beloved. Through this gesture you could let her know that you recall and cherish your time with her and look forward to more of the same. At MyFlowerTree, we believe that special occasions are the highlights in one's life and must be celebrated. These events help add color and enthusiasm to an otherwise ordinary life. These make life worth living. 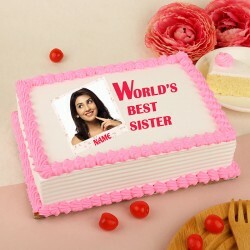 It is with the same belief that we bring forth a huge range of photo cakes online for our customers. These exclusive cakes are not only fresh, top in quality and delicious, but also a wonderful sight to look at. Popular for our express delivery services, we operate in 408 cities within the nation. To say it better, show it.With our wide assortment of personalized cakes online, you can relay your emotions without having to say a word. Best pal working at Infosys in Pune? Surprise him with midnight cake delivery in Pune on his birthday.Love of your life working in the Millenium City? Order a cake at MyFlowerTree with online cake delivery in Gurgaon, and woo her! Pick a moment, pick a cake, and we'll do the rest. 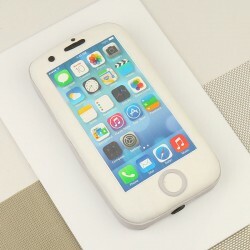 Products in this category have been rated 4.8 out of 5 based on 116 reviews.